The first series of Broadchurch was really brilliant. Taking inspiration from The Killing, it told a story very different to the typical TV detective drama; it took the same inciting incident, a murder, but rather than focus on the investigation alone, delved deep into the surrounding community, in which everyone faced different consequences, and everyone kept their own secrets. With Danny Latimer’s killer uncovered, however, I was left wondering how a second series could ever work. But writer Chris Chibnall had more tricks up his evidently-long sleeves. Series two split into two main storylines – the trial of Danny’s murderer Joe Miller and a second case, the two missing girls of Sandbrook, which DI Alec Hardy had previously failed to solve. The trial of a killer uncovered last series might not sound like particularly gripping TV, but bloody hell, it was riveting. Every second in that courtroom ramped up the tension, with errors in judgement from the detectives’ behaviour coming back to bite them, more secrets revealed without ever feeling forced, and the kind of cliffhangers that left dozens of TVs across the country smashed up in anger. The Sandbrook case, on the other hand, didn’t work so well. Due to only really allowing us to meet the three main suspects who ended up jointly responsible for the deaths, and only showing us these characters through the perspective of the detectives, this story failed to get under the fingernails of the community as the Danny Latimer case did. In fact, it was exactly what the first series’ case wasn’t: a generic detective story, stretched out well past its welcome. And thus when the final episode cut away from the excitement of Joe Miller’s release and Danny’s dad Mark dragging him out of the church in anger, the half hour spent revealing the truth of Sandbrook was… boring. I wanted to go back to Broadchurch and find out what had happened to Joe. Unfortunately, when we did get back, the ending to that story was, despite all the excitement of the trial, disappointingly daft. Rather than beating up or even killing the captive Joe Millar, Mark brought him to a cliffside hut (all dramatic incidents in this town happen at beautiful cliffside spots) where the community had gathered. With the criminal justice system having failed them, the people of Broadchurch, with a helping hand from Arthur Darvill’s secret network of vicar spies, carried out their own justice on the child murderer – they exiled him to Sheffield. Because Sheffield is just as bad a punishment as prison, right? And who cares what he does to the Northerners? I mean, really, they should have burned him in a giant wicker man and saved themselves the train fare. 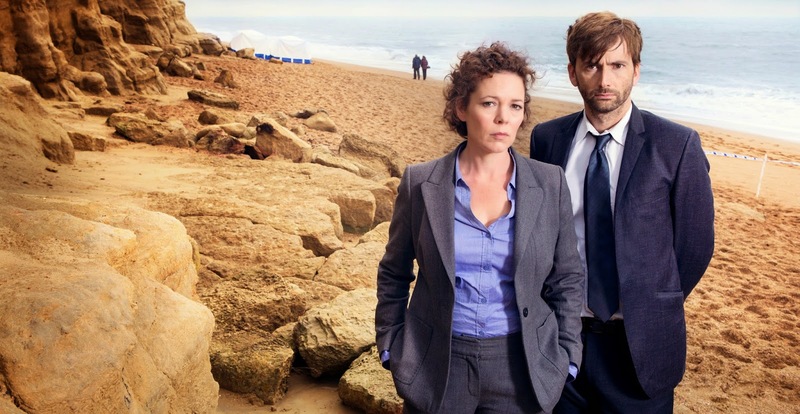 What did stay constant throughout the series, and one of the few saving graces Broadchurch has left, was David Tennant and Olivia Colman. Detectives Hardy and Miller have a truly believable, compellingly watchable relationship – one of constant frustration at each other’s methods but deep respect for each other’s talents, one where they've been through a lot together and yet it’s very fitting that they ended the series with an awkwardly formal handshake rather than a hug. David Tennant and Olivia Colman are utterly brilliant together, and Chibnall gives them some great scenes – the very moving bathroom scene in episode one, given brief comedic respite when Tennant rants at someone walking in on them, was one particular highlight. All in all, though, I did wonder if a second series of Broadchurch could ever work, and more of it failed than succeeded. So now I’m really questioning why we’re getting a third.